JTC-801 is an opioid analgesic drug used in scientific research. 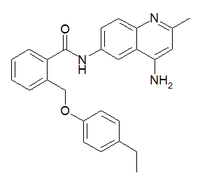 JTC-801 is a selective antagonist for the nociceptin receptor, also known as the ORL-1 receptor. This was the fourth opioid receptor to be discovered, and is still the least understood. The noiciceptin receptor has complex effects which are involved in many processes involved in pain and inflammation responses, and activation of this receptor can either increase or reduce pain depending on dose. Drugs acting at the noiciceptin receptor may influence the effects of traditional analgesics such as NSAIDs, μ-opioid agonists, and cannabinoids. JTC-801 is an orally active drug that blocks the nociceptin receptor and produces analgesic effects in a variety of animal studies, and is particularly useful for neuropathic pain and allodynia associated with nerve injury. ↑ Shinkai H, Ito T, Iida T, Kitao Y, Yamada H, Uchida I (2000). "4-Aminoquinolines: novel nociceptin antagonists with analgesic activity". Journal of Medicinal Chemistry. 43 (24): 4667–77. doi:10.1021/jm0002073. PMID 11101358. ↑ Yamada H, Nakamoto H, Suzuki Y, Ito T, Aisaka K (2002). "Pharmacological profiles of a novel opioid receptor-like1 (ORL1) receptor antagonist, JTC-801". British Journal of Pharmacology. 135 (2): 323–32. doi:10.1038/sj.bjp.0704478. PMC 1573142 . PMID 11815367. ↑ Sestili I, Borioni A, Mustazza C, Rodomonte A, Turchetto L, Sbraccia M, Riitano D, Del Giudice MR (2004). "A new synthetic approach of N-(4-amino-2-methylquinolin-6-yl)-2-(4-ethylphenoxymethyl)benzamide (JTC-801) and its analogues and their pharmacological evaluation as nociceptin receptor (NOP) antagonists". European Journal of Medicinal Chemistry. 39 (12): 1047–57. doi:10.1016/j.ejmech.2004.09.009. PMID 15571866. ↑ Muratani T, Minami T, Enomoto U, Sakai M, Okuda-Ashitaka E, Kiyokane K, Mori H, Ito S (2002). "Characterization of nociceptin/orphanin FQ-induced pain responses by the novel receptor antagonist N-(4-amino-2-methylquinolin-6-yl)-2-(4-ethylphenoxymethyl) benzamide monohydrochloride". The Journal of Pharmacology and Experimental Therapeutics. 303 (1): 424–30. doi:10.1124/jpet.102.036095. PMID 12235279. ↑ Okuda-Ashitaka E, Minami T, Matsumura S, Takeshima H, Reinscheid RK, Civelli O, Ito S (2006). "The opioid peptide nociceptin/orphanin FQ mediates prostaglandin E2-induced allodynia, tactile pain associated with nerve injury". The European Journal of Neuroscience. 23 (4): 995–1004. doi:10.1111/j.1460-9568.2006.04623.x. PMID 16519664. ↑ Zaveri N, Jiang F, Olsen C, Polgar W, Toll L (2005). "Small-molecule agonists and antagonists of the opioid receptor-like receptor (ORL1, NOP): Ligand-based analysis of structural factors influencing intrinsic activity at NOP". The AAPS Journal. 7 (2): E345–52. doi:10.1208/aapsj070234. PMC 2750971 . PMID 16353914. ↑ Rawls SM, Schroeder JA, Ding Z, Rodriguez T, Zaveri N (2007). "NOP receptor antagonist, JTC-801, blocks cannabinoid-evoked hypothermia in rats". Neuropeptides. 41 (4): 239–47. doi:10.1016/j.npep.2007.03.001. PMID 17512052. ↑ Mabuchi T, Matsumura S, Okuda-Ashitaka E, Kitano T, Kojima H, Nagano T, Minami T, Ito S (2003). "Attenuation of neuropathic pain by the nociceptin/orphanin FQ antagonist JTC-801 is mediated by inhibition of nitric oxide production". The European Journal of Neuroscience. 17 (7): 1384–92. doi:10.1046/j.1460-9568.2003.02575.x. PMID 12713641. ↑ Suyama H, Kawamoto M, Gaus S, Yuge O (2003). "Effect of JTC-801 (nociceptin antagonist) on neuropathic pain in a rat model". Neuroscience Letters. 351 (3): 133–6. doi:10.1016/S0304-3940(03)00502-0. PMID 14623124. ↑ Tamai H, Sawamura S, Takeda K, Orii R, Hanaoka K (2005). "Anti-allodynic and anti-hyperalgesic effects of nociceptin receptor antagonist, JTC-801, in rats after spinal nerve injury and inflammation". European Journal of Pharmacology. 510 (3): 223–8. doi:10.1016/j.ejphar.2005.01.033. PMID 15763246.